More and more Terrence Malick's films are becoming a collection of interesting images and random thoughts more than anything resembling coherence. The dialogue is sparse, the music more integral than ever, and yet rather than getting better at telling stories through these tools it seems the auteur peaked with his first attempt at such a loose narrative in his masterpiece The Tree of Life. Much like the more in tune with itself To the Wonder Malick directs Knight of Cups as if he is writing a poem. And by doing so he continues to stray further and further from conventional methods despite exploring themes we've seen touched upon many times before. Of course, one can't dock a filmmaker for being unoriginal in this day and age as it is the way in which they explore these emotions that really counts. The approach is clearly what is to be appreciated here while it is the ability to actually convey the sense of emotion and conflict that Malick is exploring that is coming up short. Once again the director is touching upon something of a "meaning of life" quest though this time through the eyes of a Hollywood writer rather than a Southern family in 1950's Texas or a woeful couple and pastor in the open planes of Oklahoma. We enter this indulgent environment through the guise of Christian Bale. I say guise for despite the fact we see the physical representation of this well-known actor there isn't much to suggest the true nature of who this character he's playing is much less what his journey might be about. Rather, it seems Bale has been left to figure out as much about his character of "Rick" as we have. While such methods as giving your actors only a character description instead of a fully formed script might help in capturing the natural development of said character's state of mind, for the viewers this doesn't remain consistently engaging enough for us to care what journey these characters are going on. Even worse is the fact that Malick is using such storytelling techniques in order to elicit more emotion from his actors and in turn his audience, but with Knight of Cups these attempts feel emptier than ever. Whereas Tree of Life really transcended the large themes the director was tackling through his pure filmmaking artistry Knight of Cups feels as numb as the Hollywood lifestyle it looks to comment upon. The film opens with narration from Ben Kingsley that quotes John Bunyan's The Pilgrim's Progress. Bunyan's work was written as he laid in prison in 1675/1677 and tells of the adventures that a devout Christian might meet in trying to save his soul by setting out on a pilgrimage to Heaven. Knight of Cups is clearly about a pilgrimage of sorts as well and its always been clear Malick enjoys drawing from and speculating on religious material which then leads to Brian Dennehy's (who has some powerful segments with Wes Bentley) voice over that talks of a "young prince whose father, the king of the East, sent him down into Egypt to find a pearl." The story goes on to say that, "when the prince arrived, the people poured him a cup. Drinking it, he forgot he was the son of a king, forgot about the pearl and fell into a deep sleep." What this could be in reference to is anyone's guess, but a little Google searching and it seems this short anecdote draws its inspiration from a passage in the Acts of Thomas from New Testament apocrypha or biblical writings that the Roman Catholic, Eastern Orthodox and Protestant churches do not view as part of the Bible. So, much like with The Tree of Life where Malick opens with a quote from the book of Job and then ties the main idea brought forth from that quote through to the themes of the film and arguably mimics the beats of the bible story to get at the heart of humans never being able to fully comprehend the vastness and beauty of the beginning of time and life it seems he is again taking a similar starting point here. 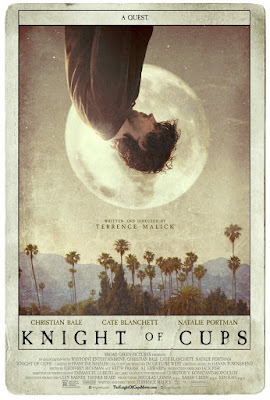 By taking this perspective on Knight of Cups it is easy to draw the correlations between Thomas and Rick. Rick became a man who would ultimately end up venturing into a land where he was seduced to the point he forgets his origins and his family until a letter is sent in the form of what is seemingly the death of his brother. Whatever this death awakens in Rick it seems he no longer knows who he is or what his course in life should be. He begins to find distraction and solace in the company of different women, but the film is not about these distractions, but more the pilgrimage to restore his soul and to find his own pearl. Rick (Christian Bale) and Elizabeth (Natalie Portman) frolic on the beach. I'm not going to pretend to be even half as intellectual or insightful as Malick as the guy clearly has a wealth of knowledge from which he pulls and that informs his ideas and storytelling, but while I can't argue the degree of substance that is contained within Malick's latest work I feel I can make something of an argument for how far removed the filmmaker has become to the point his points are no longer connecting with large portions of his audience. I appreciate a director who doesn't spell everything out for their audience, but Malick is so far removed from even this type of filmmaker that what he's trying to say gets lost in the shuffle of his own countless ideas and ideologies that he throws into his films. I think Malick himself has a clear focus and direct objective for what he wants to convey after having gathered all of the necessary references from these manuscripts and ancient texts that form his pool of knowledge, but I don't know that he cuts them down enough in scope to form a film that could be perceived as coherent when only running for two hours. It is admirable that Malick envisions telling these types of stories that contain certain conventions as if poetry has been incarnated on film. Malick is not just poetic in highlighting these immensely emotional highs and lows of his characters' lives though, but also by being largely metaphorical and as a result the finished product ends up being so open for interpretation that there is no one solid aspect that sticks with you. Hell, maybe that's the point. Either way-this leaves nothing for an audience to connect with and for a director who seems to want nothing more than for his audience to leave the theater feeling something this ends up being more a failure than a triumph. That said, Knight of Cups does naturally contain some interesting aspects as we see all these recognizable images of this world the director has seemed to so greatly avoid throughout his career. In many ways the film feels like something of a satire of not only Hollywood, but of what the world has become in general. We see all of these recognizable images that relay the banality of life as Malick and cinematographer Emmanuel Lubezki especially focus on the many advertisements that flood our environments. The futility of our day to day lives and what might ever come of these meaningless efforts are used over and over again to make the larger points Rick is chasing about his (and our) existence and its meaning. And yet, despite Malick's reliable aesthetic and Lubezki's clear skill the imagery here is less majestic than in previous efforts. The same could be said for the music as it is obviously critical to the intended emotional state the film is meant to put the viewer in at any given moment and yet Hanan Towndshend's score can hardly compare to that of Alexandre Desplat's efforts on The Tree of Life. Even Antonio Banderas' character says at one point in the film that, "the music is very important," and that it tells him when to fall in love, but we don't feel that. We don't grasp it with the same passion in which Banderas describes it. From here, the character goes on to compare love to that of the same type of love we feel with food rather than another person. We feel the need for different flavors as it were. This leads into the parade of women Rick allows into his life including Della (Imogen Poots); Nancy (Cate Blanchett), a physician he was once married to; a model named Helen (Freida Pinto); Elizabeth (Natalie Portman), a married woman who becomes pregnant with his child; a stripper named Karen (Teresa Palmer); and Isabel (Isabel Lucas) a young woman who helps him to see his way forward. It would seem these multiple women represent different emotions our core character is feeling at any given time and that they have something to do with tarot cards that are prominently featured in one section of the film and also used to break the film up into chapters, but I would sound completely out of my element trying to even guess what Malick might be implying with these details. At this point, the countless interior monologues and shots of water with every character walking on the beach at least once make it obvious that Malick doesn't care about capturing exposition or highly dramatic scenes to tell of his drama, but that the importance instead rests on how such images are pieced together. Of course, when taken as a piece of entertainment and given how many times the director relies on such imagery in Knight of Cups it seems he is getting closer and closer to self-parody than anything resembling an epiphany or emotional clarity. I also understand Malick probably shouldn't be taken simply as "entertainment", but rather that his films are more like orchestral movements than motion pictures. Still, while this is certainly an engaging approach I can't help but feel that the further Malick tends to move away from even his most loyal of fans that they will only tend to do the same with him.